12:55 Hello everyone and welcome back to AUTOSPORT Live for continuing coverage and rolling updates from round 18 in this year's FIA Formula 1 world championship - the fourth Abu Dhabi Grand Prix. Lewis Hamilton and Jenson Button gave McLaren a positive start to this weekend's proceedings, posting first and second quickest times in this afternoon's opening practice session. Hamilton posted a lap of 1m43.285s to edge out his team-mate by 0.333 seconds, with world championship leader Sebastian Vettel in third spot, his title rival Fernando Alonso fourth, Mark Webber fifth and Michael Schumacher the quickest Mercedes in sixth position. For the teams, attention will continue on helping their drivers find the best set-up for the 5.554km Yas Marina circuit, before their focus switches to a heavy fuel load and long runs in preparation for Sunday's 55-lap race. 12:56 Weather conditions remain fine and dry on Yas island, but the late-afternoon sun is begining to dip in the sky. This will create the usual visibility headache for the drivers around certain corners. Sunset is at 17:42 GST, shortly before the midway point in the session. The artificial lights will then take over, as we move into twilight and eventually, darkness. Air temperature should remain in the low-thirties Celsius range throughout, while the track surface is already cooling and will be close to matching the ambient by the end of the session. 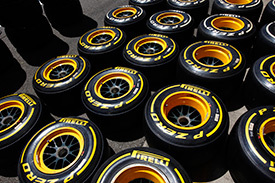 12:57 It's the soft and medium Pirellis this weekend and the second session gives teams a chance to explore both compounds, having used a single set of the hard rubber per driver in first practice. Those medium tyres looked very durable around the smooth Yas Maria circuit, despite roasting asphalt temperatures over 45 Celsius. Moving into twilight gives the teams a more representative read on likely race conditions, but signs from the first session point to very little degradation here this year. 12:57 Charles Pic takes back his Marussia this evening after an earlier debut outing for Max Chilton. 12:57 While Vitaly Petrov is also back in his updated Caterham, which Guido van der Garde didn't get very far in earlier after engine problems. 12:58 Changes to the roster for this session obviously. Bruno Senna, Narain Karthikeyan and Paul di Resta all take their seats for second practice. 12:59 Vettel is already in his car and ready for a short run once the track opens. 12:59 The typical strategy at the start of P2 is for the drivers to complete a short run of between five and seven laps. 0 min: Perez and Kobayashi are among the drivers quickly heading out for a first run. 1 min: Vergne and Senna join the early runners, followed out a few seconds later by Maldonado. 2 min: Vettel and di Resta head out - the Scot is out there of course for the first time this weekend. 2 min: Button joins the growing list of drivers on the circuit for an early blast. 3 min: Webber and Ricciardo head out, with the early group already into a timed lap. 4 min: Perez sets the ball rolling with an initial benchmark of 1m45.819s. 4 min: Schumacher, Hulkenberg and Rosberg join the fray, leaving only four drivers left in the pits. 4 min: Senna's opening effort places him sixth with a time of 1m49.744s. 4 min: The Lotus pair are soon quicker, with Raikkonen now on top in 1m44.703s as the sun edges lower in the sky. 5 min: Vettel immediately blasts to the top of the list with a lap of 1m43.323s. 5 min: Maldonado pops into fourth spot, sandwiching the Lotus pair with a time of 1m45.179s. 6 min: Vettel clearly had some go-faster juice before heading out. He improves by over three-tenths of a second with 1m43.067s. 7 min: The gap to second placed Raikkonen is now 1.636s, with Grosjean third, Perez fourth and Maldonado in fifth spot. 7 min: Webber clocks a lap of 1m45.346s and that takes him to seventh place, with all 24 drivers on the circuit. 8 min: Rosberg is now up to fourth spot with a lap of 1m44.509s. 8 min: But it's all eyes on Vettel at the moment. He takes another 0.288s off his benchmark on the third timed lap - 1m42.779s. 9 min: Schumacher leaps into third place, behind Vettel and Raikkonen, with a time of 1m44.339s. 10 min: Button is now on a quick lap in his McLaren. 11 min: Hamilton has run wide in his McLaren at Turn 8, the end of the long back straight, but is back underway. 11 min: Button springs up to second fastest in 1m42.804s, just fractions off Vettel's best. 11 min: A few seconds later, Webber moves into third place with a lap of 1m43.366s. 12 min: Vettel has shaved more time and the new benchmark is 1m42.730s. 12 min: Alonso is up to fourth fastest after clocking a 1m43.366s on the early laps of his run. 13 min: Webber continues his improving pace and consolidates fourth with 1m43.213s. 13 min: Hamilton takes over second fastest and is even closer - 0.060 seconds - off Vettel's best. 13 min: Many of the drivers have backed off and a visit to the pits looks on the cards for several in a moment. 14 min: Vettel is in to complete a first run of seven laps. He is 0.060s clear of Hamilton, with Button a further 0.014s back in third. 14 min: Webber also pits at the end of a seven lap run. He is fourth on the timesheet, 0.483s back. 15 min: Hamilton continues and is now the fastest man in the first sector. 16 min: Alonso has improved to fourth fastest with a 1m43.067s effort, some three tenths off the benchmark. 16 min: The Mercedes drivers each completed six laps and they are back in. Rosberg is seventh with Schumacher almost two-tenths off him in 11th. 17 min: Hamilton heads into another attempt, having backed off at the end of his last one thanks to traffic from future team-mate Rosberg. 17 min: Senna is already in (six lap run) and back out of the pits for another go. He is 14th in the classification, 1.755s off the leading pace. 18 min: A 1m42.777s for Hamilton on his latest attempt, now just 0.047s off Vettel's best. 19 min: Medium compound tyres for Senna and he is one of only three drivers left on the circuit. 21 min: Di Resta heads out to begin his second run in the Force India. He is only 16th after seven laps, but he is playing catch-up after all. 22 min: Rosberg is back out to begin his second run in the Mercedes. 22 min: Hamilton opts to stay out and continue his lengthy run, topping the first sector time. 23 min: Senna improves on his first timed lap with 1m44.012s. He is up to 11th position, demoting Hulkenberg and Schumacher. 23 min: A big move forwards for Hamilton there as he finds over six tenths to top the times in 1m42.095s on medium compound tyres. 24 min: Webber heads back out (fifth) to begin his second run. Hamilton's new benchmark puts the Australian 1.118s adrift. 25 min: Vettel, Schumacher, Maldonado and Ricciardo are all back out for another run. 25 min: Di Resta improves with a time of 1m44.714s. He remains in 16th spot. 26 min: "It's the normal Friday mystery," said McLaren technical director Paddy Lowe when asked about why the car was so fast in FP1. "We just go out and do our normal thing and do our best and see where we are. We have some new stuff on the car, but don't know what the others are doing. I would not have thought that what we have got on the car would explain any particular gap we have seen." 27 min: Webber ran wide on his first timed lap of the run, denting any chance he had of improving. He did lock up his front right reasonably heavily. 28 min: Hamilton lays some rubber in the pits as he wraps up a long first run on top of the times with the harder tyres. 29 min: Webber manages a better lap next time round and knocks one-tenth of a second off his best - 1m43.164s. 30 min: Rosberg posts an improvement with 1m43.658s. He is in eighth position, still a tenth clear of team-mate Schumacher. 31 min: As the sun begins to set, the artificial lighting system is really taking over now. Hamilton continues to lead team-mate Button by 0.5s. 33 min: Schumacher has registered an improved time of 1m43.484s. He jumps well above his team-mate and into sixth place. 33 min: Wobble for Alonso through the twisting final section approaching the marina, with the Spaniard currently testing the latest front wing. 34 min: Vettel posts 1m42.622s and moves into second spot. He is chipping away at the deficit to Hamilton, but the gap is still 0.527s. 36 min: Webber is shown in replay on his second run with the floor of the RB8 visibly scraping along the ground and creating sparks on the long straight, between Turns 7 and 8. 36 min: Track temperature is dropping quickly now, with grip levels and tyre performance surely impacted by the cooler asphalt. 37 min: Webber's scraping floor is similar to what we saw from Vettel's race-winning machine in India during the final few laps of last week's event. 38 min: Massa has improved to a 1m43.211s best, with the Brazilian now sixth fastest while Alonso is fifth. 39 min: Okay, so the second runs are complete. Vettel managed seven laps, as did Rosberg. Webber and Schumacher worked through a six lap stint. 40 min: While di Resta completed eight laps in the Force India. He remains down in 16th position and unable to make any advances so far. 41 min: Vergne and Perez are on track with the soft Pirelli compound tyres bolted to their cars. 42 min: Perez improves only marginally with a lap of 1m43.855s. He remains in 12th position. 43 min: Rosberg is back out there to begin his third run. He is another to take on the soft tyre. 44 min: Vergne was not finding any real improvement on the soft tyre during his first attempt. He backs off in the final sector. 45 min: Replays show that he braked way too late into Turn 12 and that ruined his first effort. 45 min: Perez has improved on his best first sector time with his third flying lap on the softer rubber. 45 min: Vergne has in fact aborted the run altogether after locking up the left front heavily. He comes into the pits. 45 min: Button is now out on soft tyres, which McLaren struggled to get the best from in India. 47 min: Webber (fourth) heads out of the garage to begin his third run in the session. 47 min: Perez is still struggling to find a major leap in pace from the softer tyres. 47 min: Rosberg has managed to find a decent improvement on the softer compound. He is up to sixth with a time of 1m43.200s. 48 min: Button clocks a relatively poor 1m42.806s lap with his first effort on the soft tyres. 48 min: Rosberg improved by 0.458s with that attempt. He is back ahead of team-mate Schumacher again. 49 min: Soft tyres for Webber on this run. He is around midway through his first timed lap. 49 min: Hamilton also fails to challenge his own benchmark with a lap over four seconds off on soft tyres. 50 min: Vettel joins the circuit, as Webber comes round in 1m42.867s. That is less than one-tenth of a second improvement. He remains fifth. 50 min: Hamilton tops the final sector on his soft tyres but still falls short of his benchmark time on the medium compound. 51 min: Grosjean is now up to second fastest with a 1m42.500s lap in his Lotus on softs. 51 min: Button restores the McLaren one-two as he finally switches on the soft rubber. 52 min: Vettel is now well into his first timed lap. For reference, his previous mark was 1m42.622s on medium tyres. 52 min: Vettel is another driver who is able to switch this compound on. He tops the pile with 1m42.056s. 52 min: Hamilton is told his pace on the soft tyre looks strong. 53 min: The German finds around six-tenths of a second there to edge out Hamilton by 0.039s, with Button third, Grosjean fourth and Alonso fifth. 53 min: Alonso finds some improvement in the soft rubber as well, now fifth fastest in 1m42.806s. 54 min: Plenty life in the softs then as Grosjean improves his first and second sector times, several laps into his run on the option rubber. 55 min: Di Resta has moved up to 14th spot, some four laps after he left the garage, with a time of 1m43.578s. 56 min: Webber moves up to fourth with a lap of 1m42.466s. Again, that is his third or fourth timed lap on the soft tyre. 56 min: Vettel comes round after a lap cooling the tyres and produces 1m41.751s, to take the advantage out to 0.344s. 57 min: Alonso improves again, this time a 1m42.587s, which is now sixth fastest. 58 min: Hamilton finally improves his best on the soft tyre, now 0.168s off Vettel with a 1m41.919s lap. 58 min: Webber pits, to end a six lap run on the softer compound. He is fourth in the classification, 0.715s off his team-mate's benchmark. 59 min: Early indications are that we are looking at a similar situation to last weekend, with many drivers taking several laps before being able to get the best out of the option tyre. 60 min: Vettel, Schumacher, Rosberg and di Resta all completed five laps on the soft compound tyre. 61 min: Kobayashi ends up 16th fastest with an improved lap on softs. Team-mate Perez is up in ninth. 61 min: Daniel Ricciardo is now on the circuit for his soft tyre run. 62 min: Raikkonen is yet to try the soft tyres and remains in the Lotus garage. 62 min: Ricciardo has slipped to 17th in the classification, with a best time so far of 1m44.903s. 62 min: Nico Rosberg is back on track to begin his fourth run of this second practice session, with just over 27 minutes of it remaining. 63 min: Button is back out to see if he can find more speed in the softer compound. 64 min: Spin for Petrov at Turn 1 as he finds the limits of the upgraded Caterham. He is back underway but may have flat-spotted the rubber. 65 min: That was an inlap for Petrov anyway, having improved to a 1m45.245s, just behind Vergne on the timesheet. 66 min: Ricciardo finds 0.5s with his first timed lap on the soft tyre. He jumps above his team-mate and into 17th spot, with a lap of 1m44.400s. 67 min: Senna moves up to 10th spot with a time of 1m43.191s. That lap drops Rosberg to 11th, who is now on his long run on soft tyres. 68 min: Vergne had that brake locking issue on his first attempt with the soft tyre earlier. 69 min: Rather than have another go to get a representative run on the option compound, he is walking out the back of the Toro Rosso garage. 70 min: Karthikeyan spun but was able to continue at Turn 17, causing a brief yellow flag period. 70 min: The track was all-clear again after only a few seconds, with many drivers on the circuit and working through their long run. 71 min: The McLaren pair join in again for a long run on the soft tyres. 72 min: Toro Rosso mechanics are looking to try and fix a brakes issue with Vergne's car, which could in part explain his aborted attempt on softs. 73 min: Webber has recently joined the circuit on soft tyres to begin his race preparation run. 73 min: Alonso locks up at the end of the back straight into Turn 8 but continues on his long run. 75 min: Raikkonen has made a late move to soft tyres, improving to sixth fastest. Team-mate Grosjean is fifth in the order. 76 min: Webber is quickly back into the pits. He was shown leaking fluid as he initially exited the garage to begin this run. 76 min: Raikkonen is back into the pits after a short outing on softs. 78 min: Red Bull mechanics go to work just to check the water pressure with Webber's car. This is of course losing the Australian vital track time. 79 min: Webber has climbed out of the car and wandered out the back of the Red Bull garage. He appears to be out of the session. 79 min: The gathering of important race data now falls to Vettel and the team only gets 50 percent of the usual Friday amount. 80 min: Vettel has just come in for a quick front wing tweak. He is back on the circuit now to continue his high fuel run. 81 min: Hamilton reports a glitch with the downshifts, a similar issue that required a steering wheel change during the Indian Grand Prix. 83 min: Vettel completes his first timed lap since the front wing tweak in a time of 1m48.084s. 84 min: Webber has returned to the Red Bull garage and is in deep discussion with the engineers, while the mechanics continue to work on his car. 84 min: Long runs continue, with teams focusing on soft tyre pace with heavy fuel. 86 min: Vergne has completed a quick visit to the pits and he is back out to conclude his race preparation run. 87 min: Vettel is in and changes over to the medium compound for his final couple of laps. 89 min: Hamilton is told his pace is "extremely good" with laps in the mid 1m47s bracket. 90 min: The flag is out on the first day of practice at Yas Marina. 14:33 Drivers again have a chance to practice starts from the grid. 14:33 Headlines from the long fuel runs are the strong pace shown by the McLaren and Webber's stoppage, resulting in no run at the end. 14:33 Sebastian Vettel tops second practice at Yas Marina with a best time of 1m41.751s, ahead of Hamilton, Button, Webber and Grosjean. 14:34 Raikkonen was sixth in the other Lotus, with Alonso seventh and Ferrari team-mate Massa in eighth spot. 14:35 Maldonado finishes the day in ninth and Sergio Perez rounds out the top 10 in the Sauber. 14:36 Other notables: Rosberg was 11th, Hulkenberg in 12th with Schumacher down in 13th position. All three are more than 1.4s off the pace. 14:37 The first day points towards another Red Bull versus McLaren weekend. 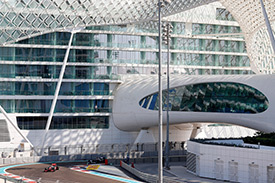 Join us tomorrow for final practice and qualifying from Abu Dhabi.